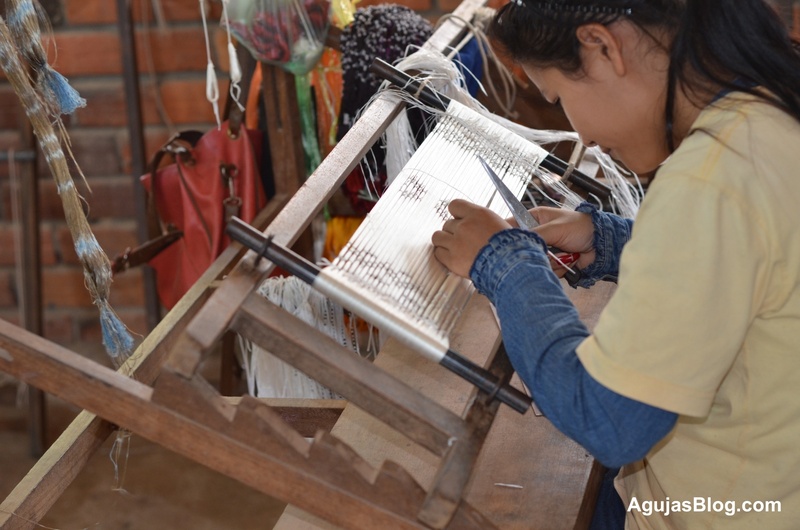 During his trip to Southeast Asia, my husband purposefully visited a couple of textile factories knowing that I would be interested in knowing about local crafts. The first place he toured was the Institute for Khmer Traditional Textiles (IKTT) in Siem Reap Angkor, Kingdom of Cambodia. 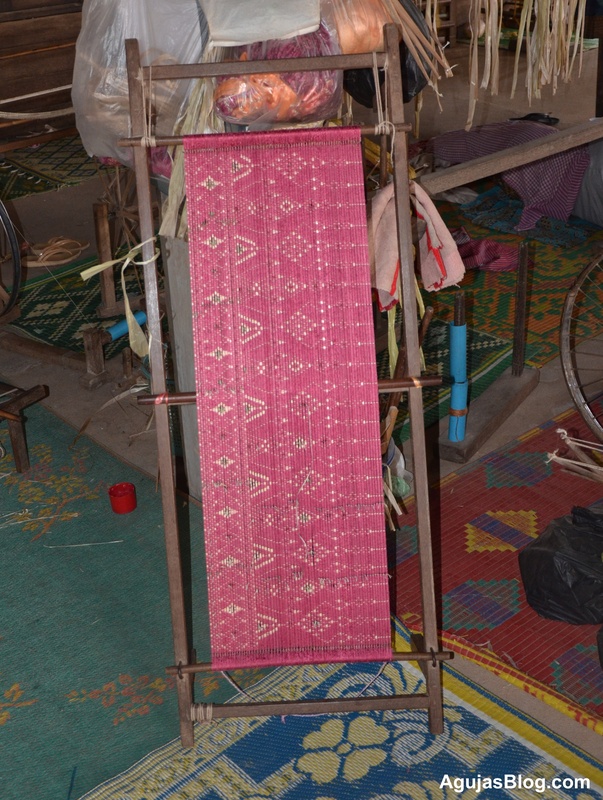 There, he walked the shop floor and took the following photographs of local women artisans spinning, dyeing and weaving traditional Cambodian textiles. 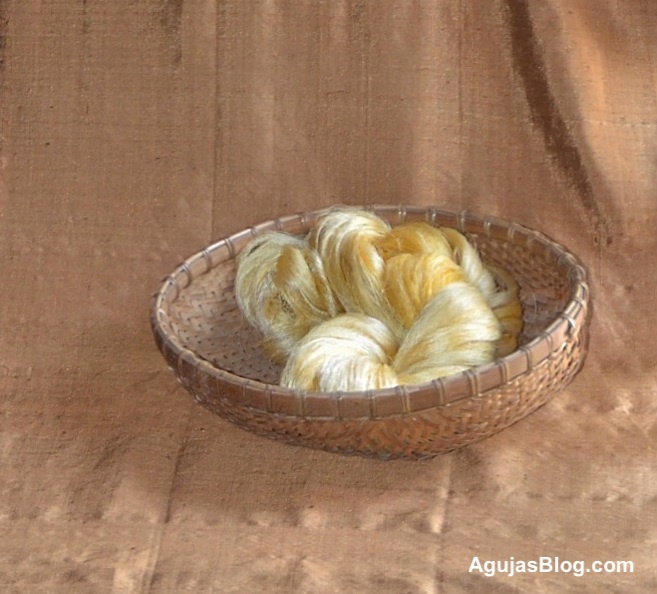 The raw yellow silk is reeled from cocoons of the same golden color. I initially thought the golden silk thread had been dyed but it is actually in its natural form. 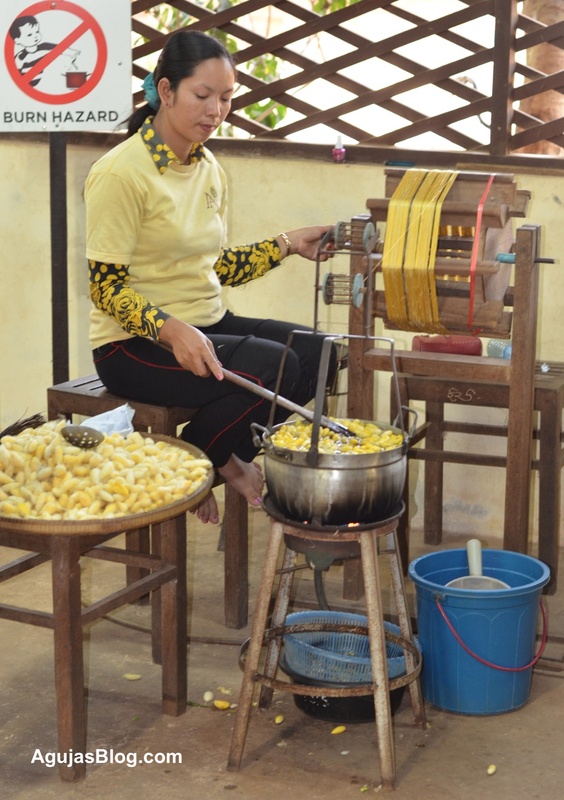 You can read more about yellow raw silk here. IKTT has also embarked on preserving and regenerating a natural forest in Siem Reap. The undertaking includes cultivating plants and trees that can be used as natural dyes. IKTT aims to restore the art of creating traditional Cambodian textiles and has established a village project called PROJECT OF WISDOM FROM THE FOREST where 140 IKTT staff currently live growing trees to be used in silk-worm raising and the natural dying of fabric. We offer job opportunities to disadvantaged women and are working to preserve the national heritage for younger generation[s]. 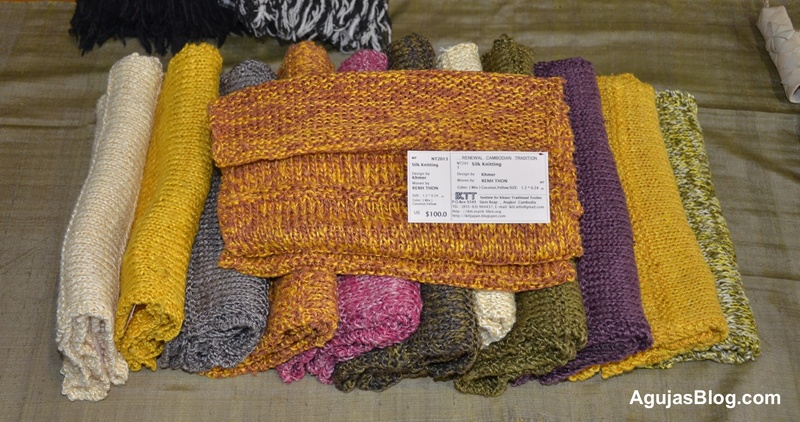 These scarves are hand knit out of 100% pure silk and sold at market. 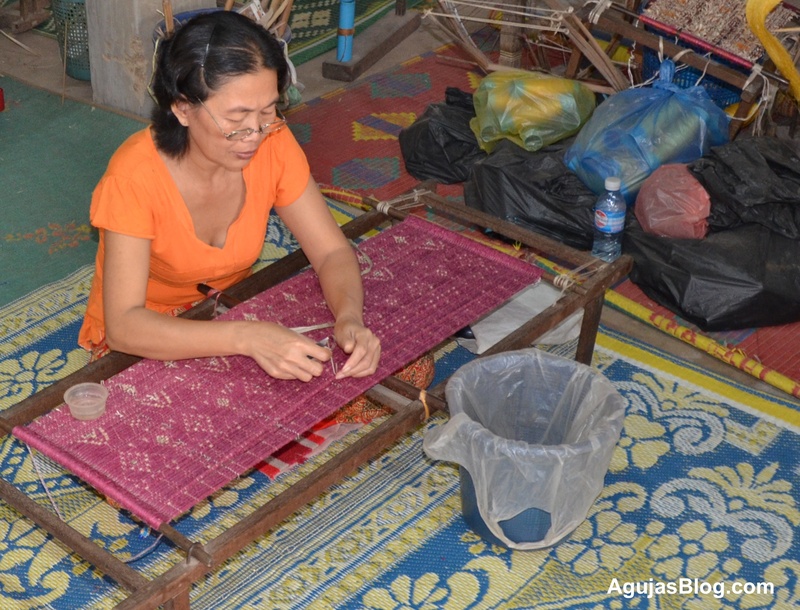 His next tour was at the Angkor Silk Farm located approximately an hour outside of Siem Reap. Run by Artisans Angkor, they cultivate Mulberry trees at the farm and continue the traditions of Khmer arts and crafts such as weaving silk textiles, stone and wood carving, and silk painting. Here, a young woman heats up the cocoons as she reels the silk threads from them. I will spare you the photograph of the platter of silk worms my husband shared with me. 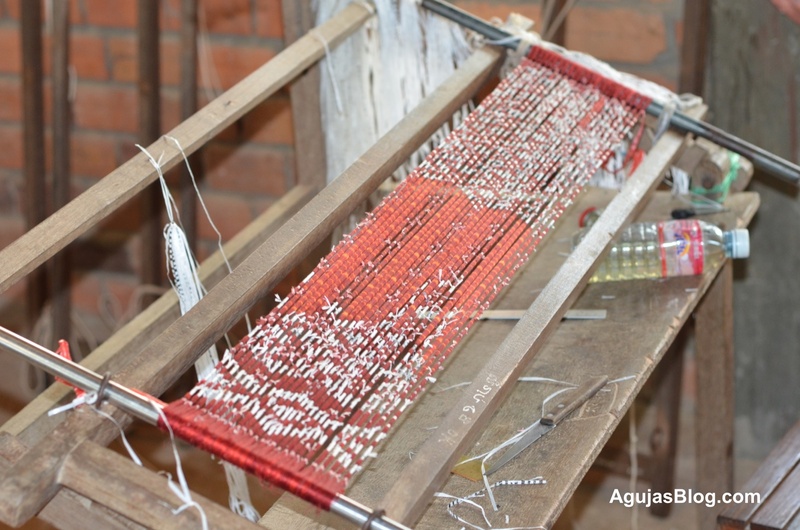 The ikat technique, or tie-dyeing of the silk threads, requires meticulous attention to detail. The term “ikat” means “to bind, tie or wrap around.” This young woman is tying a pattern onto the silk threads. My husband tells me that they would work off a picture or another textile to create the pattern. 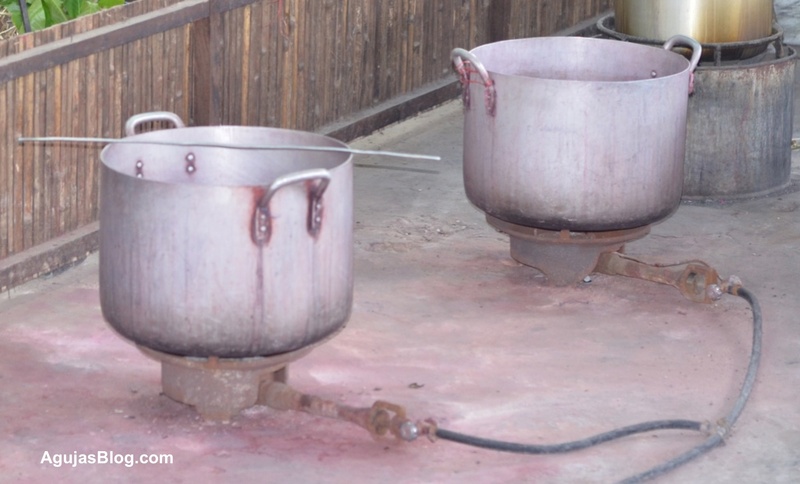 After tying the knots, they would submerge the textile into large dye pots to pick up the desired color. Once dry, they would untie the knots and dye the fabric again. This process would continue until they achieved the pattern and color palette they wanted. Apparently, some of the textiles are so beautiful that they are displayed as art and even framed in glass to protect them. 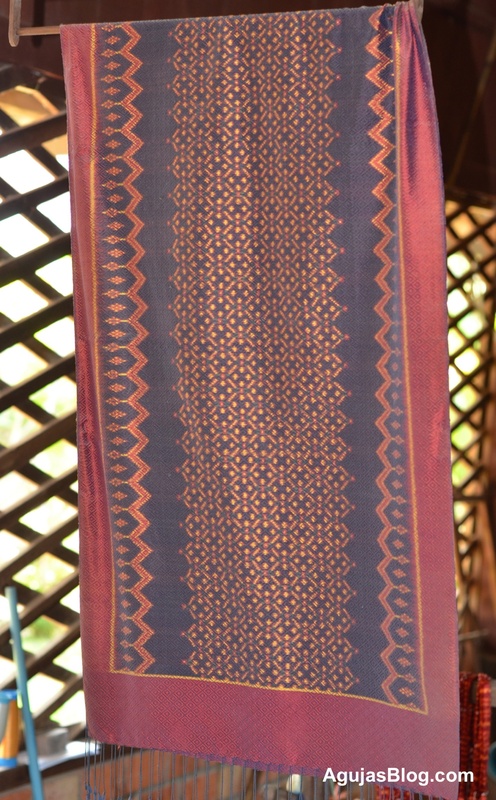 I went to the Angkor Silk Farm too, and was amazed at the effort that goes into a rug or a scarf. 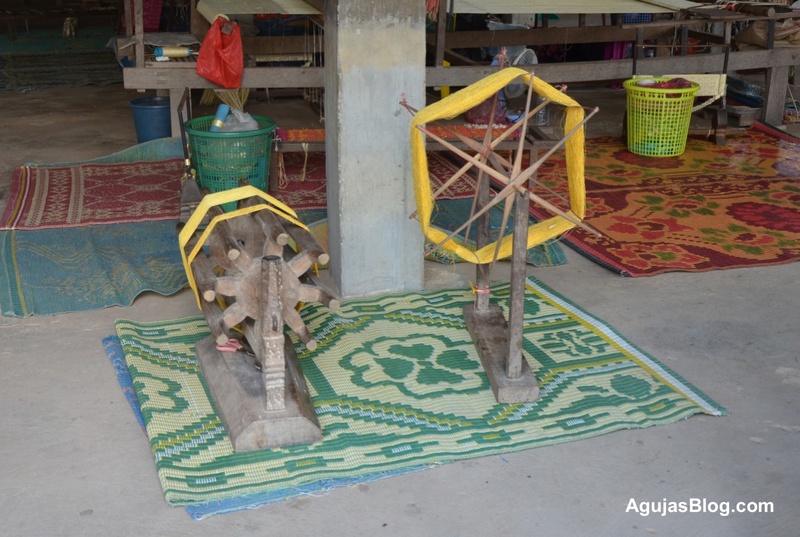 And I loved the juxtaposition of the traditional weaving with iPods of the weavers. My husband didn’t mention those! I hope to see this for myself one day as well. What beautiful fabric! There is a lot of intricate details, amazing! And to think they create the patterns by tying knots! Fascinating! Hope your husband brought you back one of those beautiful hand knitted silk scarves. Thank you so much for sharing this. What beautiful fabrics! Thanks for shaping this, it’s very interresting. Can’t believe that yellow silk colour.. I was also struck by the golden yellow color. What a shame you weren’t accompanying your husband. He certainly seems to be ‘doing’ Southeast Asia! I wish I could have gone. He loved the trip and highly recommends it. I know. That’s why my husband commented that the more elaborate textiles are displayed more as art work rather than worn or used. Wouldn’t that be an amazing vacation? What a great opportunity for you, the work those women do is amazing and beautiful!! Thanks for sharing. I like the emphasis on preserving their traditions and that this provides an income to women and families. Veronica, you must go there! Thanks for sharing these wonderful photos (and your husband’s travels) with all of us. I really want to. Must find a good time when work is not so crazy! Wow! These are amazing. Thank you for sharing the pictures from his trip. The raw yellow silk is stunning. I’m glad you liked the photographs. He actually brought me a sample of thar raw yellow silk. I’ll be posting it soon. This post was a great read! Very fascinating. And what stunning work these women do! Glad you enjoyed it. I too was impressed with the beautiful craftsmanship in a very rudimentary setting. I wish I could have gone but I’m glad that he enables my craft addiction. Wow, these are amazing. It’s unbelievable how much work goes into the finished product. I totally understand why some are displayed as art, beautiful! a very complex process in somewhat primitive conditions. Just the basics – hands, talent, boiling water, dyes.